Do you agree with these rankings? The running game has lost some of its value in recent years where rule changes and uptempo offenses have benefited quarterbacks and receivers, but the best NFL highlight is still a running back who breaks for a long rush after plowing over a defender (or three). We’ve ranked every starting running back in the league, ordering our list from worst to best. Many teams use multiple running backs these days, so we highlighted the rusher who was listed at the top of his team’s depth chart as of Oct. 1, 2018. Maybe it’s unfair to rank Conner and the Steelers last, because of stud running back Le’Veon Bell’s contract dispute, but it’s a fact that Conner hasn’t stepped up when given the opportunity to show his team he can carry the load. In a nationally televised primetime game against the rival Baltimore Ravens, Conner came up with only 19 yards, the fewest for a Steelers rusher since 1970. Barber is yet another guy who’s yet to reveal his full potential, mostly due to playing on an offense that doesn’t run the ball often. The undrafted rusher had a pedestrian rookie season in 2017 and has had a slow start to 2018, averaging only three yards per carry and no rushing touchdowns through four games. If his numbers stay low, he’ll likely lose his starting job to rookie Ronald Jones. Another likely victim of playing for a pass-heavy offense, Williams’ career numbers haven’t been impressive now into his second season. In 2017, he averaged about 34 rushing yards per game and didn’t have a single run longer than 25 yards. His performance so far in 2018 has been similar, leading to estimations that he’ll lose his starting job to teammate Aaron Jones. A nagging hamstring injury has kept this second-year rusher from showing his true potential. He’s yet to have a 100-yard rushing game but his career is likely just getting started. Of course, the Colts are one of the most pass-heavy teams in the league, so even if he’s healthy we might not get to see Mack get many touches. Like many running backs, second-year player Chris Carson has missed some significant time due to injuries but what we’ve seen of him has been pretty solid. He missed all but four games as a rookie after breaking his ankle and has missed some time in 2018, but his 59 yards-per-game average puts him at about the middle of all starters. Henry was a legend at Alabama but his NFL running capabilities have been hampered by the two-back system used by the Titans, as well as the fact that they have a quarterback who likes to run. So far in 36 career games, he’s yet to have a 1,000-yard season and has only accounted for 11 total touchdowns. In 2018, he’s shown he still has elite speed but has been about even, in terms of performance, with journeyman Dion Lewis. Arguably the most surprising running back of 2017, Collins had 1,160 all-purpose yards with the Ravens, including nearly 1,000 on the ground and 4.6 per touch, after being cut by the Seahawks. Now in his third season, Collins’ 2018 numbers have slipped a bit and he faces competition from teammate Kenneth Dixon, but it’s safe to say he runs with a big chip on his shoulder. The craziest stat about journeyman LaGarrette Blount: he’s played on three of the last four Super Bowl-winning teams, thanks to his stints with the New England Patriots and Philadelphia Eagles. His numbers have only been incredible once, when he rushed for 1,161 yards and 18 touchdowns in 2016, but he clearly knows how to win. Through four games, his 2018 numbers have been rough and are not helped by the fact that the Lions have three other guys vying for that starting RB slot. Perhaps the most mind-boggling stat of Crowell’s career, now in its fifth season, is that he’s never missed a game. He’s consistently run for 700-800 yards per season and north of four yards per rush but has made more headlines for his touchdown celebrations and controversy on social media. So far in 2018, his first with the Jets, Crowell has stuck close to his career averages despite splitting carries with Bilal Powell. Since 2017, when his 10 mostly outstanding seasons with the Vikings ended, rushing icon Adrian Peterson has bounced around a bit, playing for three other teams. When he was signed by the Redskins this year, nobody expected too much from the back who has played a full season only once since 2012, due to constant injuries. But he’s been nothing short of brilliant through three games in 2018, racking up more than 300 all-purpose yards and three rushing touchdowns. Will Peterson’s fountain of youth run dry or are we witnessing a renaissance? Freeman’s numbers suffer from being part of a tandem-rusher system in Denver, but he has looked impressive so far in his rookie season. He has split carries almost evenly with fellow rookie Phillip Lindsay in 2018, trailing him in most categories except rushing touchdowns. The system has made both Freeman and Lindsay look solid, but it has made it impossible for either guy to separate himself as one of the league’s top individual rushers. Another college star who’s waiting to prove himself in the NFL, Michel had an outstanding career at Georgia, especially in his senior season in which he accounted for more than 1,300 all-purpose yards and 17 touchdowns. His rookie NFL season gained some big steam in a 112-yard rushing day in week four, which included his first NFL touchdown. The Patriots aren’t typically known for their rushing game, so hopefully we’ll get to find out if it was just a flash of brilliance or the start of something special. Ajayi’s stats are rarely eye-popping, but he turned into the Eagles go-to rusher during the team’s Super Bowl run in 2017. He doesn’t get a ton of carries on an offense led by one of the league’s top passing games, but he’s already racked up three rushing touchdowns through four games in 2018. Now in his fourth season, Ajayi has passed the 1,000-yard mark only once. 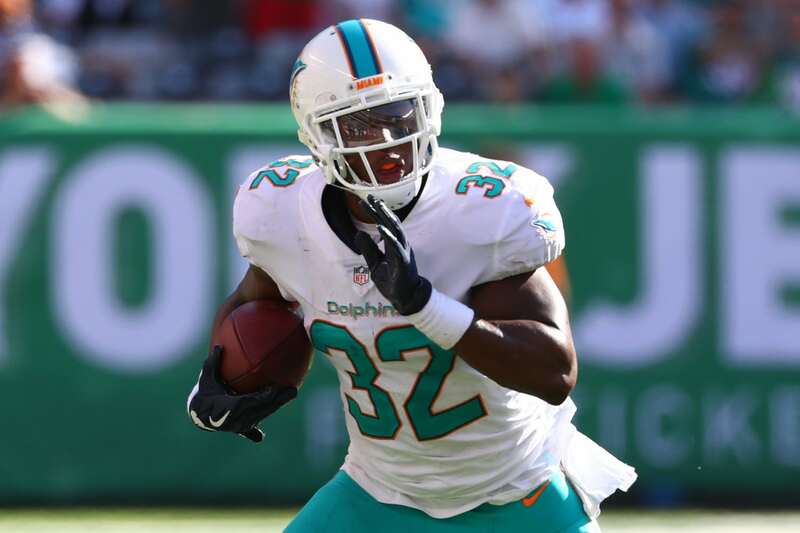 Lamar Miller has averaged close to 1,000 rushing yards each of the last four seasons, but his touchdown totals have slipped since his outstanding 2015 season with the Miami Dolphins. His opportunities have dipped with the arrival of the Texans dynamic quarterback Deshaun Watson in 2017. Miller’s numbers appear to be on the downslope, including his yards-per-carry average, which has dropped steadily each year since 2014. Through week four of the 2018 season, no NFL rusher has more rushes of at least 20 yards . Breida also leads all starters with 7.6 yards per carry. He didn’t start a game as a rookie in 2017, but his yards-per-carry numbers were a decent 4.4. So far, with a small sample size, Breida has been making the most of his time as the 49ers starting running back and fans have been clamoring for the team to use him more. Now in his third season, and first as a day-one starter, Drake showed what he could do by leading the league in rushing through the final three games of 2017. He’s now splitting time with veteran Frank Gore and, for some puzzling reason, is only getting about eight touches a game. We’ve seen some brilliance from Drake, but unless the Dolphins use him more we may not know what he’s truly capable of. After a record-breaking start to his rookie season in 2017, Dalvin Cook was sidelined by a knee injury after just four games in which he averaged more than 100 yards. In 2018, through three games started, he’s looked less impressive, averaging about 32 yards per game and just 2.7 yards per carry. Cook’s touches have also dipped significantly this year, in the wake of the Vikings offense shifting quarterbacks. Injuries have stalled Mixon’s second NFL season so far, but as a rookie, he showed promise by racking up nearly 1,000 all-purpose yards for the Bengals. Through less than two full games in 2018, he averaged more than 90 yards, including 4.7 per carry. He’s expected to return this year after getting hurt in week two, but we’ll see if his power is intact. Currently in his fifth NFL season, Hyde has consistently improved his numbers with each passing year in the league. He topped 1,200 all-purpose yards, his most ever, in 2017, which was his final with the 49ers. Now with the Browns, Hyde leads all AFC starting running backs with five rushing touchdowns through four games in 2018. The days of “Beast Mode” meaning a guaranteed 1,200-yard and 12-touchdown season are likely over, but Lynch can still strike fear in the hearts of defenders. In his 11th season, the veteran rusher was averaging 75 yards per game and 4.4 yards per carry through four games of 2018. Most fans would still love to have him lining up in their team’s backfield. At Stanford, McCaffrey proved to be one of the most versatile players in college football history, racking up almost 7,000 all-purpose yards in a little more than two seasons. In the NFL, he’s still looking for that breakout season but he’s certainly one of the best dual-threat running backs. In his rookie season, he proved to be a bit more useful catching passes than taking handoffs, but he’s become a legitimate rushing threat in 2018. Through the Panthers’ first three games, he was averaging 90.3 yards per game on the ground. He always keeps a defense guessing. Now in his third season as a full-time starter, Howard has proven himself to be one of the league’s best young running backs. He’s topped 1,000 yards in each of his first two seasons, but his numbers have been a little slower out of the gate through week four of 2018. So far this year, he’s only averaging about 50 rushing yards per game and has just one touchdown. Arguably the most hyped rookie of 2018, Barkley has been impressive through the first four games of his career. So far, he’s averaged 65 yards per game and 4.6 per carry, in addition to nearly 200 receiving yards through week four. His three rushing touchdowns also equate to about half of his team’s scores to this point. LSU legend Leonard Fournette lived up to his hype during his 2017 rookie season, in which he helped the Jaguars almost get to the Super Bowl. He accounted for 10 total touchdowns, and no turnovers, in 13 regular-season games during that season. So far, his 2018 season has been marred by injury, giving him just 90 all-purpose yards and no scores through four games. But football fans at all levels have seen what Fournette is capable of, so it’d be foolish to start doubting him now. Now in his fourth season, Chargers star Melvin Gordon has improved his numbers every year so far. He always gets a ton of carries but, through four games in 2018, he’s got the second-most receiving yards among all NFL running backs, to go with 69 yards per game on the ground. He’s already accounted for five touchdowns and hasn’t fumbled once. He’s one of the best up-and-coming backs in the league. The Falcons star rusher has been fantastic every season since 2015, raking in about 4,300 all-purpose yards in that span, not counting his team’s playoff runs. Freeman had mostly avoided injuries in his four previous seasons but got hurt after just 36 yards rushing during the first game of 2018 and has been missing ever since. He’s expected to be back on the field soon, where he’ll almost surely pick up where he left off. Unlike most veteran running backs, McCoy hasn’t missed long stretches of action due to injuries and has been a consistent 1,000-yard rusher nearly every year since 2010. He’s had a few great years with the Bills but, as part of that terrible team this year, his production has been virtually nonexistent so far in 2018. Are McCoy’s best days behind him or is he the victim of a bad team? The latter is the better bet. Almost nobody expected David Johnson to become one of the league’s top talents when he was drafted 86th overall by the Cardinals in 2015, but that’s exactly what has happened. He was injured in 2017, but Johnson’s 2016 season — when he had more than 2,100 all-purpose yards and 20 touchdowns —remains incredible. His 2018 return got off to a bit of a slow start, mostly due to a lack of touches, but it’s clear he’s still one of the league’s best dual-threat runners. Maybe the best-catching running back in the entire league, Alvin Kamara has proven to be freakishly athletic into his second season. The 2017 offensive rookie of the year, Kamara tallied more than 1,500 all-purpose yards and 13 touchdowns last year, when he led all running backs in receiving yards. Through four games in 2018, he’s again among the league’s top receivers, regardless of position, with 336 receiving yards — and he leads all NFC starting running backs with five rushing TDs. One of the league’s brightest young stars, Chiefs rusher Kareem Hunt hasn’t stalled since breaking out as a rookie in 2017. He led the league in rushing yards that season, with 1,327 yards to go with 455 receiving yards and 11 touchdowns. Despite carrying the ball often, he’s only fumbled once through 20 career regular-season games. Through week four of 2018, he’s averaging nearly 80 rushing yards per game and has already accounted for four touchdowns. If he keeps it up, he’ll likely top this list in years to come. Other guys do it with more flash but Ezekiel Elliott remains maybe the best pure rusher in the NFL, now in his third season. His 2017 numbers only looked disappointing because of his insane 2016 rookie season, in which he contributed 2,000 all-purpose yards. So far in 2018, he’s at the top of the rushing class, averaging more than 100 rushing yards per game. Elliott has led the league in rushing yards per game in both seasons he’s played so far and is showing no signs of slowing down. But, in our opinion, there’s one running back who we’d rather have starting for our team. A stud from day one, Gurley capped off his 2017 season with more than 2,000 all-purpose yards — including 1,300 on the ground — and 19 touchdowns. He’s a great dual-threat player on an explosive Rams offense, which he’s proving again in 2018 with nearly 200 yards receiving through week four, in addition to about 85 rushing yards per game. Oh, and he’s also already got six touchdowns in the first four games. It was a toss-up between he and Elliott for the top spot, but, given the sheer amount of touches he gets and his all-around offensive abilities, we had to crown Gurley the king. If you want more NFL action, click here to see our ranking of all the league’s starting quarterbacks.